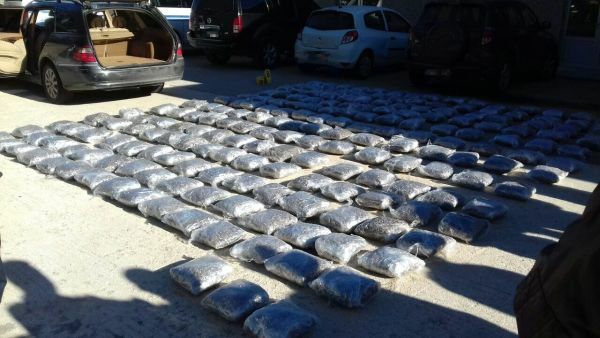 BiH Border Police officers seized on Wednesday about 200 kilograms of the drug “skunk” in the border area of Bileća. As BiH Border POlice said in the press release, R.B. (born in 1978), M.K. (born in 1978), M.K. (born in 1977) and N.V. (born in 1983), nationals of Montenegro, attempted to smuggle the drugs from Montenegro into BiH. Packages were detected in several places in a Mercedes, with BiH registration plates, while two vehicles, with Montenegrin registration plates, were the forerunner, i.e. were in the role of the “cleaner”. The seizure of the mentioned drug is the extension of the continuous work of members of BP BiH on prevention of illicit drugs trafficking. “The quantities of narcotic drugs seized, and cases recorded over the past two years, exceed the statistics from previous years. Better results are the product of the continuous work of BP BiH officers on the suppression of narcotic drugs abuse and, on this occasion, I would like to thank members of BP BiH for all the activities they undertake to protect the state border, despite the insufficient working conditions. During the nine months of 2018, members of BP BiH reported 68 criminal offences involving narcotic drugs, for which 75 persons were reported”, said Director of BP BiH Zoran Galić. He added that the activities on preventing illicit traffic in drugs, and other forms of cross-border crime, would be the priority in the forthcoming period. The BiH Border Police, in press release, reminds that in 2016 its officers detected and seized more than a ton of marijuana and crops of Cannabis Sativa. The largest seizure of marijuana in that year was in the area of Trebinje, when 343 kilograms were discovered and seized, while the rest of the drug was confiscated in the areas of Velika Kladuša, Brčko, Grude, Bijeljina, Gacko etc.